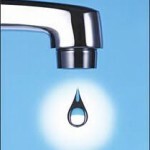 Santa Cruz has instituted a policy of strict water rationing. A family of four is allotted a monthly ration of 10 units of water, or 7,480 gallons, to cover all uses, including watering the lawn. Violators who exceed their monthly ration face penalties of $50 per unit, and their monthly water bills often surpass $500. One man returned from an eight-day vacation in Hawaii to discover that he had a $4,000 water bill. The flapper in his toilet tank was leaking, and he was repeatedly penalized. Residents who incur penalties on their bills can now attend city water school. The Santa Cruz water department set up a water school this year, modeled after traffic school, in which residents can get fines waived for completing a two-hour water conservation class. In addition to penalizing violators on their water bills, the city employs two water cops who write tickets for offenses like irrigating during the daytime or hosing down pavement. Filling hot tubs is also banned. As a result of the city’s conservation efforts, water use in Santa Cruz has decreased 26 percent from its 2012-2013 average. Conversely, statewide water use has increased by 1 percent this year. Tim Quinn, executive director of the Association of California Water Agencies, said other cities should use Santa Cruz as a model. Some California cities have already adopted water restrictions similar to Santa Cruz’s but others are counting on a predicted El Nino storm season to hit the state in the next year. Chances, though, of an El Nino arriving are decreasing from 90 percent to 50 percent, according to the most recent reports. Government again financially slaps their servants for being disobedient. We continue to have a “build at any cost” mentality…even approving new construction when our water resources are threatened. I think we should stop all new construction until we have proven water resources, I don’t need more new residents (or visitors) putting pressure on my disappearing water. However, if we insist on being stupid, I think we should have a two tier water system. First tier water would be all current residents. Second tier would be anybody new who moves here knowing our water supply is stressed. When our water supply gets low, they would be the first in line to have their water supply reduced, maybe even cut off before the first tier people face those extreme measures. It’s our choice. Stop metering in new water users or develope a tier system. Without the “build at any cost” mentality those in charge would not get the kickbacks and political contributions from the builders and developers, of course you need to be the “right” ones to get your projects approved.